"CMH" redirects here. For other uses, see CMH (disambiguation). John Glenn Columbus International Airport (IATA: CMH, ICAO: KCMH, FAA LID: CMH), is an international airport located 6 miles (9.7 km) east of downtown Columbus, Ohio. Formerly known as Port Columbus International Airport, it is managed by the Columbus Regional Airport Authority, which also oversees operations at Rickenbacker International Airport and Bolton Field. The airport code 'CMH' stands for "Columbus Municipal Hangar," the original name for the airport. John Glenn Columbus International Airport is primarily a passenger airport. It provides 140 non-stop flights to 34 airports via 7 airlines daily. In 2016, traffic reached 7.3 million, which was an 8% increase over 2015. Traffic in 2017 reached 7.6 million passengers, approaching the record set in 2007. According to a 2005 market survey, Columbus attracts about 50% of its passengers from outside its 60-mile (97 km) radius primary service region. 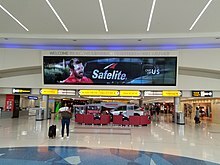 John Glenn Columbus International Airport is the largest passenger airport in central Ohio and second busiest in the state after Cleveland Hopkins International Airport and offers service to most major airline hubs. Cincinnati's international airport, Cincinnati/Northern Kentucky International Airport, is located just south of the city in Kentucky. Accessing John Glenn Columbus International Airport by road is possible by two interstate highways: I-270 to the northeast and I-670 to the west. The main airport roadway, International Gateway, connects directly to I-670. On May 25, 2016, the Ohio General Assembly passed a bill to rename the airport from Port Columbus International Airport to its current name, in honor of astronaut and four-term U.S. senator John Glenn. The name change was unanimously approved by the airport's nine-member board on May 24, 2016. Ohio Governor John Kasich signed the bill into law on June 14, 2016 with the name change becoming official 90 days later. On June 28, 2016, a celebration of the renaming was held and new signage bearing the airport's new name was unveiled. In 2017, after completion of the $80 million terminal renovation, the airport was named by trade organization Airports Council International as the most improved airport in North America in 2016. The airport opened July 8, 1929, on a site selected by Charles Lindbergh, as the eastern air terminus of the Transcontinental Air Transport air-rail New York to Los Angeles transcontinental route. Passengers traveled overnight on the Pennsylvania Railroad's Airway Limited from New York to Columbus; by air from Columbus to Waynoka, Oklahoma; by rail again on the Atchison, Topeka & Santa Fe from Waynoka to Clovis, New Mexico; and by air from Clovis to Los Angeles. The original terminal building and hangars remain; the hangars are still in use, but the old terminal sits derelict. During World War II, most of the facility was taken over by the U.S. Navy, which established Naval Air Station Columbus in 1942. NAS Columbus was closed and the facility relinquished back to civilian authorities in 1946. Also, during the war, the government established a government-owned aviation factory on the grounds of the airport known as Air Force Factory 85, eventually operated by North American Aviation. The plant produced the F-100 Super Saber, RF-6 Vigilante, T-2 Buckeye, T-28 Trojan, OV-10 Bronco and T-39 Sabreliner. The diagram on the February 1951 Coast & Geodetic Survey instrument-approach chart shows runways 006/186 3550 ft long, 052/232 4400 ft, 096/276 4500 ft, and 127/307 5030 ft.
A $12 million terminal building opened on September 21, 1958. Jet airline flights (American 707s) started in April 1964. The April 1957 Official Airline Guide shows 72 airline departures each weekday: 41 TWA, 16 American, 6 Eastern, 6 Lake Central and 3 Piedmont. The first major airline to fly into Port Columbus was TWA, and it kept a presence at Columbus over seventy years during the era of airline regulation. TWA offered a club for exclusive passengers up until 2000 when America West took over a gate held by TWA and the club itself due to financial problems. Port Columbus International Airport was formerly a hub of America West Airlines in the 1990s, but the company closed the hub in 2003 due to financial losses and the post 9/11-decline in air travel. Skybus had its hub at Port Columbus. The airport was the home base of short-lived Skybus Airlines, which began operations from Port Columbus on May 22, 2007. The airline touted themselves as the cheapest airline in the United States, offering a minimum of ten seats for $10 each on every flight. Skybus ceased operations April 4, 2008. A $70 million renovation of airport facilities, designed by Brubaker, Brandt Inc., was initiated in 1979 for the airport's 50th anniversary and completed in 1981. This upgraded the airport's capacity to 250 flights per day by adding what is known today as Concourse B and added fully enclosed jetways at every gate. Ten years later in 1989, a second, $15.5 million, seven-gate south concourse (now Concourse A) was dedicated. The concourse was used exclusively by US Airways at the time, and later housed hubs for both America West Airlines until 2003, and Skybus Airlines until they shut it down in 2008 due to their bankruptcy. 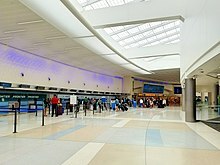 A north concourse was completed in 1996, which is now Concourse C, and was expanded in 2002. Between 1998 and 2000, numerous airport expansion and renovation projects were completed, including a $25 million terminal renovation in 1998 that included additional retail shops, new flight information displays, enhanced lighting, upgraded flooring, and a new food court. Also, new hangars and office spaces were completed for NetJets in 1999, as well as a $92 million parking garage including an underground terminal entrance, new rental car facilities, dedicated ground transportation area, improved eight-lane terminal access on two levels, and a new atrium and entrances in 2000, which were designed by URS Corporation. Port Columbus began its Terminal Modernization Program in late 2012, which included new terrazzo flooring throughout the airport, new ceilings, new restrooms, more TSA security lanes, and new LED lighting. Construction started on Concourse A in late 2012 and was completed throughout the terminal in early 2016. In 2013, the airport completed a $140 million runway improvement that moved the south runway farther from the north runway. This created a buffer distance that enables simultaneous takeoffs and landings on the north and south runways, increasing air traffic volume. Columbus mayor Michael B. Coleman commented, "As the city grows, the airport needs to grow with it." In 2001, Executive Jet Aviation (now known as NetJets), opened up a 200,000-square-foot (19,000 m2) operational headquarters at Port Columbus International Airport. In November 2006, Skybus Airlines began leasing 100,000 square feet (9,300 m2) of office and hangar facilities at the Columbus International AirCenter adjacent to Port Columbus. Regional carriers Envoy Air and Republic Airline operate large maintenance bases at the airport. The airport has its own police and fire departments (ARFF-C). Runway 10R/28L: 10,113 ft × 150 ft (3,082 m × 46 m), air carrier runway, ILS equipped. Runway 10L/28R: 8,000 ft × 150 ft (2,438 m × 46 m), air carrier runway, ILS equipped. Runway 10L/28R is just north of the 40th parallel north. An expansion in 2008–2009 moved the primary access road to the main terminal, over which a new aircraft bridge was built. The Port Columbus Airport Crossover Taxiway Bridge was intended to ease congestion of aircraft traffic and allow aircraft to move from the main terminal to outer runways. For the 12-month period ending December 31, 2017, the airport had 129,377 aircraft operations, an average of 354 per day: 22% air taxi, 15% general aviation, 62% scheduled commercial, and <1% military. There are 78 aircraft based at this airport: 23 single engine, 5 multi-engine, 48 jet aircraft, and 2 helicopters. John Glenn Columbus International Airport has 3 airport concourses. Concourse A (gates A1 – A7) was built in 1989 for US Airways and is currently home to Southwest, which uses all the gates with the exception of A1 (no jet bridge) and A7 (ground-level boarding gate). Concourse B (gates B19 – B36) is the original section of the current CMH terminal built in 1958 and is home to Air Canada (B30), American (B19-26, 28), Spirit (B35-36), and United (B29-32, 34). Gates B15 through B18 and B33 are no longer accessible due to concession and restroom construction; gate B33 has had its jet bridge removed. Concourse C (gates C46 – C56), opened in 1995 for Delta and Southwest and extended in 2002, is home to Alaska (C49), Delta (C50-56) and Frontier (C47); C48 is currently unused. Vacation Express charters also depart from Concourse C, typically using Gate C46, which is also used for international arrivals and connects directly to customs and immigration. Currently, the only international arrivals are the seasonal flights from Cancún and Punta Cana, as well as the daily flights to Toronto–Pearson. In addition to the airlines above, Columbus is also served by Allegiant Air which, as of 2019, operates to 12 destinations from nearby Rickenbacker International Airport. No regular, scheduled air cargo operations take place at CMH. Columbus' extensive dedicated domestic and international cargo operations take place at Rickenbacker. The airport is accessible directly by taking exit number nine on Interstate 670 to International Gateway. Alternatively, drivers can also get to the airport from the east via Hamilton Road, just south of Interstate 270, and enter at Sawyer Road or from the west via Stelzer Road. In addition to housing the rental car facilities, a six-story parking garage (which is attached to the terminal) provides long-term and short-term parking. Lower cost satellite parking options, with continuous free shuttle service, can be found in the Blue, Red and Green parking lots along International Gateway. The Blue lot is the closest to the terminal and also offers some covered parking. The cost of parking a car in the blue lot is $9 per 24 hours. The Red Lot costs $7 per 24 hours and the green lost costs $5 per 24 hours to park.The Green lot is the furthest away from the terminal. Additionally, there is a free cell phone lot accessed from the outbound side of International Gateway. Beginning in May 2016, the Central Ohio Transit Authority (COTA) began expanded bus service between John Glenn Columbus International Airport and downtown Columbus. The service, named AirConnect, stops at the airport's arrival and departure levels every 30 minutes, 7 days a week, before heading downtown. Once downtown, stops are made at the Greater Columbus Convention Center and many of the downtown hotels. Tickets are available for purchase at a kiosk in the airport with credit cards (only) and on board the bus with cash (only). Other routes available from COTA include Line 7-Mt. Vernon, which travels between the airport and downtown via East Columbus between approximately 5am to 10pm. Line 23-James/Stelzer connects to Easton and Eastland Malls and serves the airport via remote stops on Stelzer Road. Finally, the OSU-Air line serves the Ohio State University campus at the beginning and end of Autumn and Spring semesters. The GoBus Rural Inter-City Bus Service operates a thrice daily schedule to Athens, via Lancaster, Logan, and Nelsonville. Inbound taxi services operate through numerous taxi businesses in the Columbus area. A number of taxi services provide outbound transportation in the taxi lane. On June 27, 1954 an American Airlines Convair CV-240 (N94263) from Dayton International Airport was on approach to Runway 27 at 300 feet (91 m) when the left side of the plane collided with a US Navy Beechcraft SNB-2C Navigator (BuA23773), also on approach. The Convair recovered and landed, though the nose gear collapsed on landing. The Beechcraft crashed short of the runway, killing two on board. The probable cause was attributed to "A traffic control situation created by the tower local controller which he allowed to continue without taking the necessary corrective action. A contributing factor was the failure of both crews to detect this situation by visual and/or aural vigilance." On January 7, 1994, United Express Flight 6291 was a BAe Jetstream 41 being operated by Atlantic Coast Airlines; it was on approach to runway 28L when it entered into a stall at 430 feet (130 m) above runway level. The aircraft collided with a stand of trees and came to rest inside a commercial building 1.2 miles (1.9 km) short of the runway and burst into flames. The accident killed all three crewmembers and two of five passengers. The probable cause was attributed to "(1) An aerodynamic stall that occurred when the flight crew allowed the airspeed to decay to stall speed following a very poorly planned and executed approach characterized by an absence of procedural discipline; (2) Improper pilot response to the stall warning, including failure to advance the power levers to maximum, and inappropriately raising the flaps; (3) Flight crew experience in 'glass cockpit' automated aircraft, aircraft type and in seat position, a situation exacerbated by a side letter of agreement between the company and its pilots; and (4) the company's failure to provide adequate stabilized approach criteria, and the FAA's failure to require such criteria. Member Vogt concluded that the last factor was contributory but not causal to the accident. Additionally, for the following two factors, Chairman Hall and Member Lauber concluded that they were causal to the accident, while Members Vogt and Hammerschmidt concluded they were contributory to the accident: (5) The company's failure to provide adequate crew resource management training, and the FAA's failure to require such training; and (6) the unavailability of suitable training simulators that precluded fully effective flight crew training." ^ "Press release" (PDF). newshub.columbusairports.com. ^ "Columbus Regional Airport Authority" (PDF). Archived from the original (PDF) on December 14, 2010. ^ a b "Port Columbus Sets New Passenger Record in 2007". Columbus Regional Airport Authority. January 25, 2008. Archived from the original on September 3, 2009. Retrieved February 11, 2008. ^ "Airport ABCs: An Explanation of Airport Identifier Codes". skygod.com. Retrieved July 22, 2007. ^ "John Glenn Columbus Non-stop Destinations". Columbus Regional Airport Authority. 2016. Archived from the original on June 11, 2011. Retrieved January 21, 2016. ^ "REGIONAL AIRPORTS ECONOMIC IMPACT STUDY, WILBUR SMITH ASSOCIATES, INC., January 2005, Chap 1 pp2-4" (PDF). Archived from the original (PDF) on July 14, 2010. Retrieved April 7, 2010. ^ "Bill naming John Glenn airport passes in Ohio". Associated Press. ^ Julie Carr Smyth (May 25, 2016). "Ohio Airport to Be Named in Honor of Astronaut John Glenn". Associated Press. Retrieved June 16, 2016. ^ Johnson, Alan (June 14, 2016). "Law signed naming John Glenn International Airport". The Columbus Dispatch. Retrieved June 16, 2016. ^ "Ohio's Columbus airport renamed for astronaut John Glenn". Retrieved July 1, 2016. ^ "Original Port Columbus Airport Terminal, 1929–1958". Marker #94-25 Original Port Columbus Airport Terminal, 1929–1958 / Original Port Columbus Airport Terminal, 1929–1958. Ohio History Connection. Archived from the original on November 12, 2013. Retrieved November 12, 2013. ^ Fred J. Bunyan (January 1959). "Columbus Prepared for Progress". Flying Magazine. ^ a b c d e f g h i j "Port Columbus Milestones". Columbus Regional Airport Authority. 2012. Retrieved July 28, 2012. ^ "Item - National Naval Aviation Museum". ^ a b "America West in Columbus". PSA History Page. 2003–2007. Archived from the original on August 10, 2007. Retrieved July 22, 2007. ^ "Skybus To End Operations". 10TV.com. April 4, 2008. Retrieved March 9, 2018. ^ "Engineering News-Record". Engineering News-Record. 202 (1–13): 271. 1979. Retrieved June 28, 2012. ^ "Terminal Modernization Program – At Port Columbus – FlyColumbus". ^ Weese, Evan (August 22, 2013). "Port Columbus 'Staying Ahead of Demand Curve' With New South Runway". Columbus Business First. ^ "Executive Jet, Inc. Inaugurates New Operations Center". Netjets Inc. June 14, 2000. Archived from the original on September 27, 2007. Retrieved August 16, 2007. ^ "Skybus will establish headquarters at Columbus International AirCenter". Skybus Airlines Inc. November 10, 2006. Archived from the original on July 10, 2007. Retrieved August 16, 2007. ^ "75 Years of Flight in Columbus". Columbus Regional Airport Authority. 2004. Archived from the original on February 5, 2005. Retrieved August 16, 2007. ^ "Flight Timetable". Retrieved August 29, 2018. ^ "More westward options for Columbus, Ohio customers with Delta's new Salt Lake City service". Delta News Hub. ^ "Check Flight Schedules". Retrieved April 7, 2018. ^ Inc., Spirit Airlines,. "Spirit Airlines Adds Columbus, Ohio to its Growing Network". ^ Rose, Marla Matzer. "Columbus lands nonstop United Airlines flight to San Francisco". ^ "RITA – BTS – Transtats". ^ "Port Columbus Air Service Reports". flycolumbus.com. Retrieved July 10, 2014. ^ "Comprehensive Annual Financial Report (pg 61). Retrieved Mar 29, 2015" (PDF). Archived from the original (PDF) on April 2, 2015. Retrieved March 29, 2015. ^ John Glenn Columbus International Airport, . Accessed October 6, 2018. ^ "Parking Maps". Columbus Regional Airport Authority. 2007. Archived from the original on August 16, 2007. Retrieved August 16, 2007. ^ "Shuttle Lots and Airport Property". Columbus Regional Airport Authority. 2009. Archived from the original on December 7, 2009. Retrieved December 5, 2009. ^ "COTA plans bus line between airport and Downtown". Retrieved February 20, 2016. ^ "Route A: Columbus // Athens // Parkersburg Schedule -". ridegobus.com. ^ "Taxi Services". Columbus Regional Airport Authority. 2007. Archived from the original on July 13, 2007. Retrieved July 22, 2007. ^ "ASN Aircraft accident description Convair CV-240-0 N94263". Aviation Safety Network. 1954. Retrieved November 13, 2007. ^ "ASN Aircraft accident description British Aerospace BAe 4101 Jetstream 41 N304UE". Aviation Safety Network. 1994. Retrieved November 13, 2007.